If you have read my blog you know that I love animals as much, if not more than people. I definitely trust animals more than people. This past January I was fortunate enough to spend the entire month volunteering at Bally Vaughn Animal Sanctuary located outside of Harare, Zimbabwe. 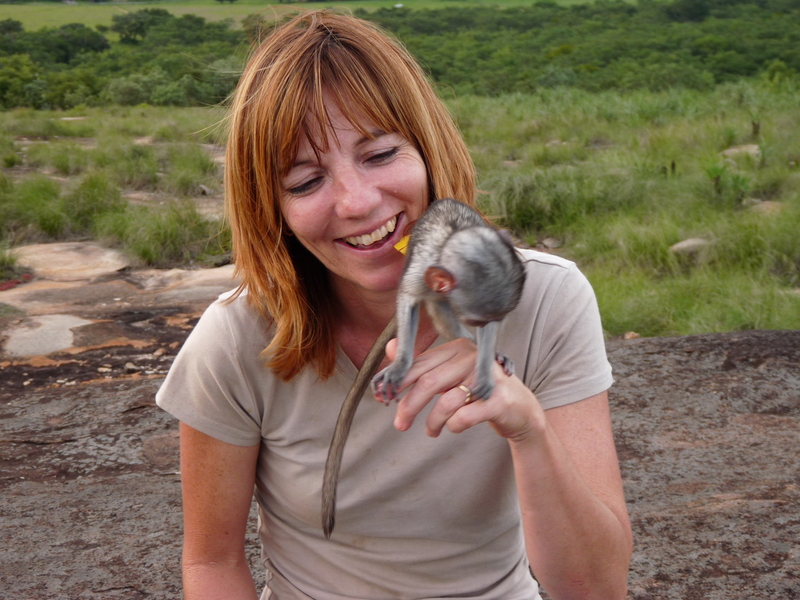 I chose BV because of Sarah Carter (pictured above with Zimba, a baby Vervet who was rescued at 3 weeks when his mother was killed). Before deciding where and how I was going to dedicate my time and money while doing this month of service I did a lot of research. I found Sarah and Bally Vaughn through the website http://www.volunteer4africa.org/. Every word that I read on her website resonated with me. The love, care and respect that Sarah and her team have for the animals truly aligned with my personal feelings. Sarah is one of those amazingly self-less people that has dedicated her life to making sure that each and every animal she comes in contact with is given every opportunity to live, thrive, and flourish with dignity and respect. There was not one day during the entire month I spent at BV working along side Sarah, Colin, Sasha, Mirka and others that I did not feel needed, wanted and fulfilled. I definitely received more than I gave. Although there were moments when the work was easy and fun (playing hide and seek with Meredith, the Meerkat or playing my iTunes and singing Beyoncé or Bruno Mars to Juno and Fluffy two of our recently rescued lions), there were other moments that were hard. The day I found out that Daisy, the baby donkey with a compound fracture that we had rescued, didn’t make it. She used to lay her head in my lap and I would sing here lullaby’s while stroking her soft fur, willing her to live. The morning we woke to find out that wild otters had broken into the geese enclosure killing several members of that family. There were many days that were hard. Such is the circle of life. I’ve always hated that expression. However, it was much easier to accept the circle of life than it was the simple ignorance of people and the way they treated their animals. Going out on rescues with Sarah was difficult and rewarding. She explained to us that being angry or rather showing anger toward the locals did more harm than good. Rescues were not a time to scold but to educate. Education as we all know is the key to freedom and prosperity. I found that I loved being part of that education process. I noticed that when spoken to with kindness and respect the locals would listen and really had a desire to do what was right. They just needed to know what “right” was. After eight years running Bally Vaughn, Sarah Carter has finally been able to realize her dream of purchasing land and creating a new, improved sanctuary for the animals called Twala’s Trust. Unfortunately, Sarah has been stopped from moving the animals to their new home by the owners of land BV sits on. They are claiming that Sarah is “stealing” their “property”. Property in this case being the animals. This is simply not true. The day that the animals were ready to be moved, by ready I mean tranquilized and crated with love, careful planning and the animals best interest at heart. The owners of the land that BV sits on locked the front gates and barricaded entrance. They have since filed an injunction and have made ludicrous and untrue accusations. Unfortunately, as of this post the animals are still being held prisoner at BV. That’s where you come in. I know we are a long way from Zimbabwe but it only takes one voice, one person, to raise awareness. for the full details of what has been going on. If you feel it’s appropriate then add your voice, write a blog, donate as little as $5.00 to help with the legal fees. This entry was posted in Africa and tagged Animal Rescue, Animal Sanctuary, Animal welfare, Lions, Sarah Carter, Zimbabwe. Bookmark the permalink. I have received a PUBLIC STATEMENT (from): GORDON AND DEBBIE PUTTERILL. Having thoroughly read their statement I am convinced it is just more of the same self-serving propaganda they have been putting out since the beginning of the attempted move of the animals to Twala Trust. Having spent a month at Bally Vaughn I feel confident that I know Sarah and Vin well enough to know when the truth is being stretched in an effort to leverage public opinion against them. That said, I have chosen not to post their public statement on my blog. The Putterill’s will have to find another forum to spread their message. For the love animals… I would do anything. Thank you, Joanne for all you (and Mark) do and have done over the years for residents of BV! I have worked with Sarah on and off for 13 years. I know exactly what has been done at the sanctuary and has not and I can say without a shadow of a doubt that everything that has been done and every improvement that has been made has been as a direct result of Sarah’s hard work and dedication. In all the time I have spent there I have not once seen Gordon Putterill there, I certainly have never seen him at any of the fund raising events and certainly have never seen him or Debbie getting their hands dirty! In actual fact I do not even know what he looks like that is how much I have seen him there in the 13 years I have volunteered with Sarah!!!! Their official statement is nothing but a fabrication! Not one thing said in it is true, not one!!!! I have also noticed with despair that the photos they have SUDDENLY found necessary to post on their facebook page stating ‘a rescued cheetah’ – it is a sad testament that they have no idea that that Cheetah’s name was Ralph and Ralph died a very content happy cheetah under Sarah’s care apparently the oldest cheetah on record!!!!! Sorry i will not go on and on but people have to know exactly what these people are like! Many thanks for your post and your hard work!! Thank you, Diane for taking the time to write a thoughtful, heartfelt and honest reflection of the work that Sarah has been doing and will continue to do. I wish I could do more. Thank you for helping to spread awareness of this situation. Shared on Twitter – I hope everything works out and works out soon. It’s such a good cause and those animals deserve the best life they can have which Sarah and her team are working hard to provide. Who are these”putter ills” and how on earth do they manage to get away with this ???? This is being sent from the United States of America and I will make sure that people here will be made aware of what is happening !!! Different countries, different rules. Unfortunately, the Putterill (nice place on the name) family own the land that the animals have been residing on. This behavior on their part is financially motivated and NOT in the best interest of the animals. That fact they believe they “own” the animals speaks volumes. I know that Sarah does not believe she “owns’ the animals. They are her family and family takes care of family regardless. The thought of her having to leave her “family” behind is horrifying. Thank you for spreading the word and caring about this situation. I am reposting this blog due to the importance and time sensitive nature of the situation. Please continue to support Sarah Carter in her efforts to move forward with Twala Trust and getting the animals to their new homes. Tweet, blog and/or donate. Spread the word. Thank you!